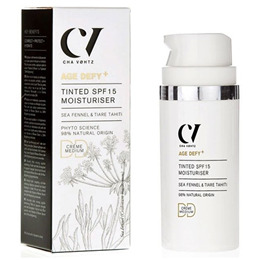 Green People Age Defy+ Tinted DD Moisturiser - SPF15 defines, delays and delivers. It is the UK`s first Certified Organic DD cream. This daily use Tinted DD Moisturiser has a unique skin-kind formula, offering sheer coverage and a natural glow to all skin types with no colour matching required. Made with colour correcting natural earth minerals, this lightweight cream will reduce redness, balance out sallow complexions and won’t block pores, leaving you with a smooth and even skin tone. Aqua, Titanium Dioxide, Isoamyl Laurate, Prunus Amygdalus Dulcis (Sweet Almond) Oil*, Hamamelis Virginiana (Witch Hazel) Water*, Simmondsia Chinensis (Jojoba) Seed Oil*, Cetearyl Olivate, Glycerin, Sorbitan Olivate, Caprylic/Capric Triglyceride, Dicaprylyl Carbonate, Lauryl Olivate, Butyrospermum Parkii (Shea) Butter*, Polyglyceryl-2 Caprate, Benzyl Alcohol, Sodium Stearoyl Glutamate, Magnesium Aluminum Silicate, Cetyl Palmitate, Sorbitan Palmitate, Sucrose Stearate, Stearic Acid, Alumina, Triticum Vulgare (Wheat) Starch*, Sodium Dehydroacetate, Xanthan Gum, Aroma [Natural], Tocopherol, Glyceryl Caprylate, Squalane, Zea Mays (Corn) Starch*, Crithmum Maritimum (Sea Fennel) Callus Culture Filtrate, Dehydroacetic Acid, Galactoarabinan, Sodium Phytate, Helianthus Annuus (Sunflower) Seed Oil, Sodium Hyaluronate, Elaeis Guineensis (Palm) Oil, Gossypium Herbaceum (Cotton) Seed Oil, Cocos Nucifera (Coconut) Oil, Bidens Pilosa Extract, Linum Usitatissimum (Linseed) Seed Oil, Sodium Benzoate, Potassium Sorbate, Gardenia Tahitensis Flower Extract, Lactic Acid, Citronellol, Geraniol, Limonene, Linalool. May Contain +/-: CI 77891 (Titanium Dioxide), CI 77492 (Iron Oxides), CI 77491 (Iron Oxides), CI 77499 (Iron Oxides). Ecocert 98.4% Natural Ingredients, 13.0% Organic Ingredients. Use after cleansing or exfoliating. Apply sparingly to face, neck and decolletage, taking care to gently blend into the skin. Below are reviews of Green People Age Defy+ Tinted Moisturiser- Medium- 30ml by bodykind customers. If you have tried this product we'd love to hear what you think so please leave a review. 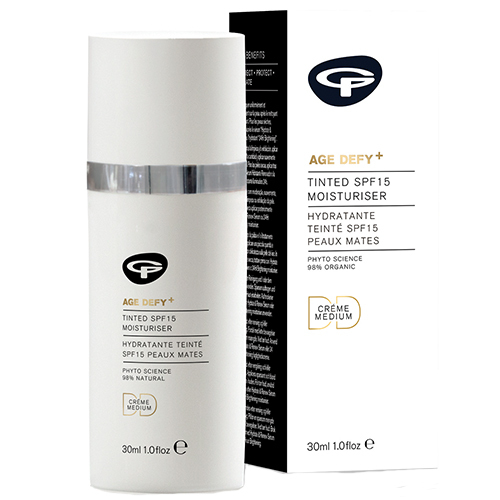 Green People Age Defy+ Tinted DD Moisturiser - SPF15 - Medium defines, delays and delivers. It is the UK`s first Certified Organic DD cream.